The Chicago Tribune and Tribune Co.’s other US newspaper titles will run a week-long experiment starting from next Monday by using as little Associated Press (AP) content as possible. The trial is part of review into costs and follows the Tribune’s warning to the agency last year that it might drop the service. Last year a group of newspapers in Ohio forged an alliance (the Ohio News Organisation or OHNO) to share their top stories in a move against AP copy. This entry was posted in Editors' pick, Newspapers and tagged AP, Associated Press, Tribune Co, us on November 3, 2009 by Laura Oliver. This entry was posted in Editors' pick, Journalism, Newspapers and tagged life after newspapers, michael kinsley, newspaper executive, Newspapers, social networking, Tribune Co, Twitter on April 6, 2009 by Judith Townend. Publisher of the Chicago Sun-Times has filed for bankruptcy protection following in the footsteps of its rival, Tribune Co, which filed last December. This entry was posted in Editors' pick, Newspapers and tagged Bankruptcy, Chicago Sun-Times, sun, Sun-Times Media, the Chicago Sun-Times, Tribune Co, us on April 1, 2009 by Laura Oliver. via Eric Ulken (former interactive technology editor at the LA Times). 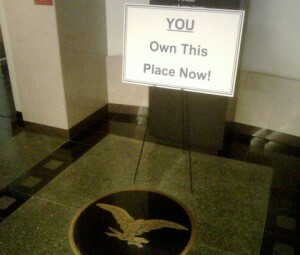 ‘Those signs seemed a bit disingenuous even then, given the structure of the deal to take the Tribune Company private. Now they seem, well, ridiculous’, he writes. This entry was posted in Journalism, Newspapers and tagged Bankruptcy, editor, LA Times, the LA Times, The Tribune Company, Tribune Co on December 9, 2008 by Judith Townend.